In a previous tutorial, we learned all about the completely redesigned New Document dialog box in Photoshop CC 2017 and how to use it to create new Photoshop documents. While many of us will see the redesign as an improvement, not everyone will agree. 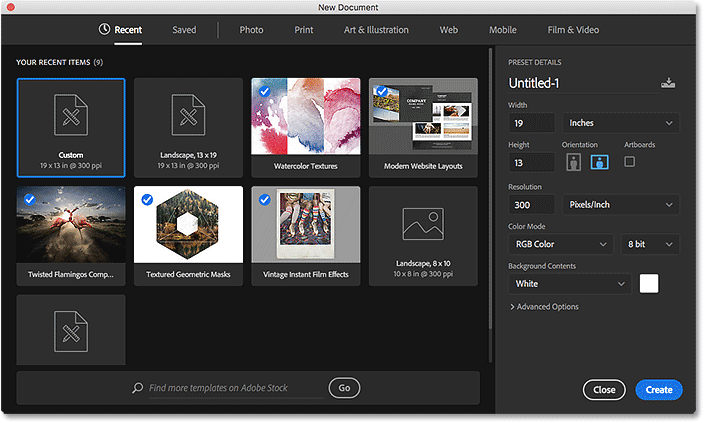 Long-time Photoshop users may prefer the smaller, more compact layout of the original New Document dialog box. Even if you're new to Photoshop, you may want to try both versions (the redesign and the original) to see which one you like best. 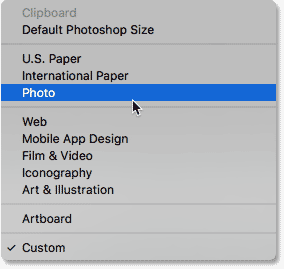 Thankfully, the original New Document dialog box is still around in Photoshop CC 2017. Adobe now calls it the "legacy" New Document dialog box, and in this tutorial, we'll learn how to easily switch between the redesigned version and the legacy version. We'll also take a quick look at how the legacy version works. Let's get started! Clicking the New... button on the Start screen. 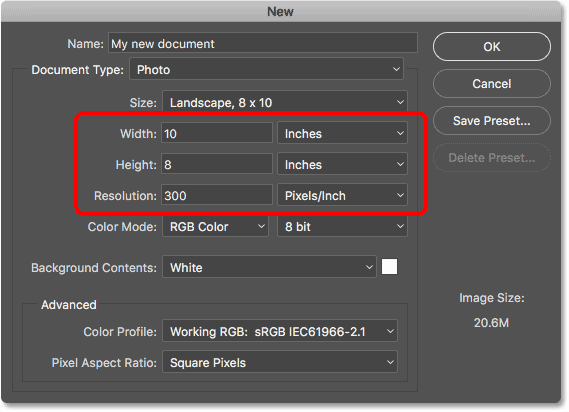 The redesigned New Document dialog box in Photoshop CC 2017. 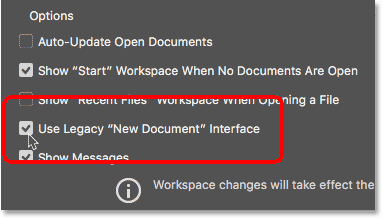 Selecting the 'Use Legacy "New Document" Interface option. 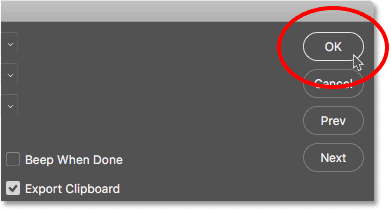 Closing the Photoshop Preferences dialog box. Clicking the New... button once again. The legacy New Document dialog box in Photoshop CC 2017. 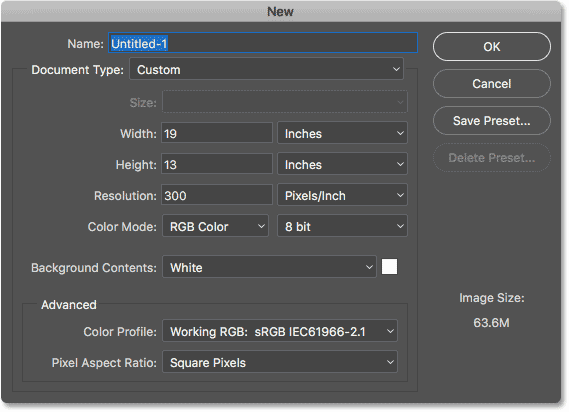 Just like with the redesigned New Document dialog box, we can start by seeing if there's already a preset we can use that matches the document size we need. Photoshop includes a few built-in presets, and as we'll see later, we can also create our own. Clicking the Document Type option. Clicking the Size option to view the presets. The document settings update to the preset values. Click OK to accept your settings and create your new document. If you've gone through the presets and none of them will give you the document size you're looking for, you can easily create a document using your own custom settings. Simply enter whatever values you need into the various options. 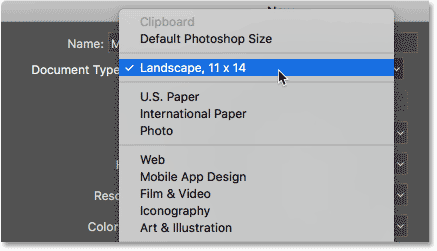 For example, if I want to create a Photoshop document that's 11 inches by 14 inches, all I need to do is set the Width to 11 inches and the Height to 14 inches. This will give me a document in portrait orientation. 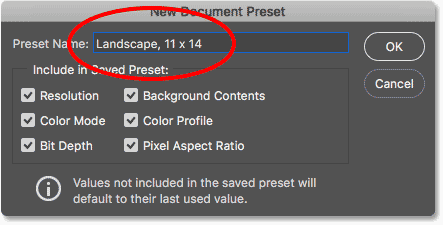 If I needed landscape orientation instead, I'd swap the values, setting the Width to 14 inches and the Height to 11 inches. 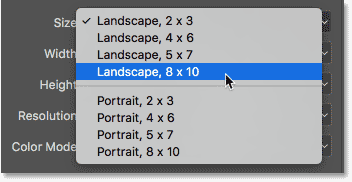 In the redesigned New Document dialog box, there are handy buttons for instantly switching between portrait and landscape orientation. In the legacy version, we need to do it manually. I also want to be able to print this document in high quality, so I'll leave the Resolution value set to 300 Pixels/Inch. If you're creating a document for the web or for a mobile device, you don't need to worry about the Resolution value. Entering custom values for the new document. Inches is just one of several measurement types we can choose from. Another option you might want to change is Background Contents. 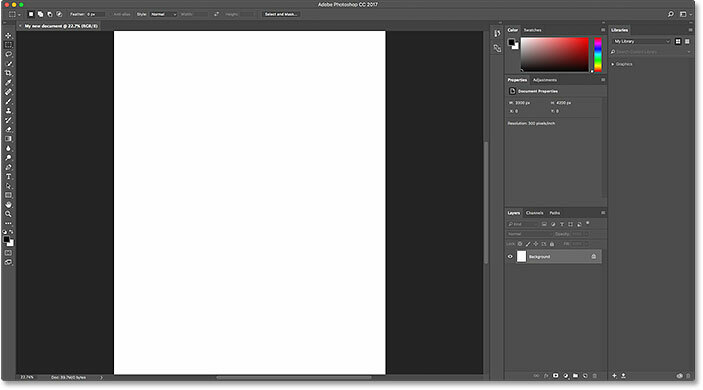 The default background color for a new Photoshop document is white. In most cases, white works fine, but to change it, click on the Background Contents box and choose a different option from the list. One thing to note here is that unlike the redesigned New Document dialog box where we need to first open the Advanced Options before Transparent will appear in the Background Contents list, in the legacy version, it's available to us right away. The Color Mode, Bit Depth and Color Profile options. Click OK to create your new custom Photoshop document. Naming the preset in the New Document Preset dialog box. The saved preset now appears as a Document Type option. Select the preset you want to delete, then click Delete Preset. Clicking OK to create the new document. The new document opens in Photoshop. 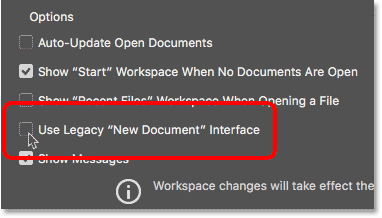 Unchecking 'Use Legacy "New Document" Interface' in the General Preferences. And there we have it! That's how to easily switch between the redesigned and the legacy New Document dialog box, along with how to create new documents using the legacy version, in Photoshop CC 2017! The one big feature of the redesigned New Document dialog box that's not available to us in the legacy version is templates. New in Photoshop CC 2017, we can now create new documents from templates which allow us to add our own images to pre-made layouts and effects. To use the templates feature, you'll need the redesigned New Document dialog box. I'll cover how to use templates in a separate tutorial.